Boys in our Books reviewer Tracy also organizes the upcoming Gay Romance Northwest Meet-Up, an LGBTQ romance fiction conference that will be held in Seattle on September 20, 2014. She’s stopping by the blog to talk about the upcoming event and also do a giveaway of three ebooks by attending GRNW authors Astrid Amara, Kim Fielding, and Rick R. Reed! What is the Gay Romance Northwest Meet-Up? Well, first, thank you to BioB for hosting us! It’s great to get the word out about our event. 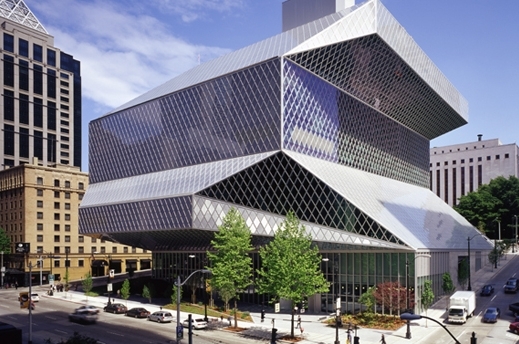 The Gay Romance Northwest Meet-Up (or GRNW) is a one-day conference that will be in Seattle on September 20 at the Seattle Central Library. (Check out a pic of the library below!) It’ll be a full day of activities, from writing workshops to a reader meet-up with games and giveaways to author pitch sessions with seven attending publishers, including Dreamspinner Press, Less Than Three Press, MLR Press, and Bold Strokes Books. The afternoon will be a keynote address and also panel discussions with LGBTQ romance authors and publishers, who will be talking about different topics related to the genre, from writing to publishing to how the genre is changing and expanding. It’s going to be a really full, but fun day, and no matter what you read in LGBTQ romance, there should be something there for you, from supernatural shifters to epic fantasy to contemporaries. This is the second GRNW Meet-Up. How did GRNW get started and what’s different this year from last year? What we found was that everyone we talked to was interested in doing a local event, and things snowballed really quickly to becoming a reality. We met in that bar in mid-April 2013, and five months later, held the first GRNW conference at the Seattle Public Library on Sept. 14, 2013 with over 30 attending authors and over 120 attendees. It was a really great experience, and one that was really built by people coming together from all over who all shared the same love of these awesome books. The biggest differences between this year and last year? Well, we’re a little longer for one. Last year we were just the afternoon and evening. This year, we’re the whole day, so we’re offering more programming, including the reader meet-up and writer workshops. The pitch sessions with publishers is also new. We’re really excited about that part. I’ve met a lot of local aspiring writers, and it’s great to provide them an accessible chance to meet with LGBTQ publishers. The other big difference is that we’re highlighting more lesbian and trans* romance this year. Last year we were almost entirely gay romance fiction, and some of the feedback we received was a real desire for more diversity and to better represent the full spectrum of queer romance, which we 100% agree with, so this year, we focused on bringing in more authors who write f/f and trans*/gender queer romance. The latter is definitely still growing, but it’s vital that we highlight it. I’ve met a lot of *very hungry* trans* readers who want more media starring trans* characters, so it’s a genre that needs more attention and more growth. The other big difference…That would be more free books. Two publishers, Blind Eye Books and Riptide Publishing, are donating free paperbacks for every attendee. We’re super psyched about this. Plus a lot of the authors are donating free books to give out at the reader meet-up, so everyone’s going to have something to take home with them. We’re a nonprofit, volunteer-run event with a *very* small budget, so it’s so great to give so much swag to attendees. How is GRNW different from other events, like GRL or RT? The simple answer is we’re smaller, shorter, and cheaper. At max our event space fits 275, so we’re not as big as GRL which is around 400, and no way near the mammoth size of RT. Our main conference activities is one day, although we’ll have activities going on the night before, including a book store reading, but we’re way shorter. Because of that, our tickets are just $25. But our main goal isn’t to be GRL or RT. Although we’re so excited that we’re getting attendees from outside the northwest, we started this to be a local event and to focus on being accessible and affordable to fans from around the region, especially readers who may not be able to budget a big conference, but could fit in a day event. That, and we wanted to connect authors to these readers. Some readers may never be able to make the bigger events, but if we can help connect them to a favorite author, then that’s amazing. And our hope too is that more small regional events will pop up around the country, so more readers, no matter where they are, can have the chance to meet authors and other readers. LGBTQ romance can be a little lonely because we’re often so separated in real life and can only talk with each other online. Our hope is to help create more chances for people to meet in real life, and be able to have that amazing community feeling that we often feel online. Speaking of community, we know connecting to the community is a big part of GRNW. How did that start? A big part of our mission is to connect LGBTQ romance to resources within the local community. So, even though I’m talking about the conference, it’s not our only event. Since we started back in 2013, we’ve held the first conference and also 10 public reading events with local authors—at book stores, at the Seattle Library, and at LGBTQ nonprofits that do literary events. Our big mission is to provide, over and over and over again, opportunities for authors and readers to get together and also for the greater community to hear about these books. So, along with the big flagship conference, we strive to put on other smaller, free events throughout the year, as well as local reader meet-ups. Those events and interactions have better tied us to the range of community resources within Seattle and beyond, from LGBTQ nonprofits to the library to even the City of Seattle (who just awarded us a small grant to help with marketing.) Having those connections definitely makes us stronger, and I feel, very slowly, we’re making some traction with our goal of getting the word out. Thanks for telling us all about the event. We can’t wait to hear how GRNW 2014 goes! For more info about GRNW 2014, visit their website! Tickets are on sale now, and the event is open to all readers, writers, and fans of LGBTQ romance! Three GRNW 2014 authors have donated a free ebook for a giveaway, all to go to one lucky commenter. Kim Fielding’s new novella The Pillar, Astrid Amara’s new novel The Devil’s Lancer, and Rick R. Reed’s recent romance Legally Wed.
Leave a comment below for a chance to win all three! Drawing to be done on Sunday, August 17! Wow, I wish I lived on that coast. I would be there. I’d love to see a meetup in the northeast! Sounds like a lot of fun I wish I could go. Oh my thank for the giveaway and Wish i could attend the meet up a few of my favorite authors will be there. Wish I still lived in Seattle so I could attend. Thanks for the great giveaway. I would love to go but unfortunately, I seem to be living in the wrong continent to join most of these events. It sounds really good. Have fun! Oh, wow, that’s really amazing, Tracy! List of authors is really impressive, some of my favorites are going to be there. If I ever do move out to the West coast I will definitely try to attend! It’s too far away for me but I wish you lots of fun! Sounds like a great event! Thanks for the post and the fantastic giveaway. I am going, and bringing my daughter! The event sounds great. Thanks for the giveaway! Sounds like a great event. I would love to go to it. Maybe on my next west coast vacation I can manage to time it to be there. This sounds like so much fun. I like the idea of a smaller venue. Sounds like a good time will be had by all. Can’t wait to hear about the fun. It sounds like a really good time. I wish I could be there. Thank you for the giveaway! I hope I can go! This sounds like a great time. I really wish I could make it to Seattle for this! Thanks for the chance to win! Oh this would be fun. I’m in Seattle often, but mostly on family issues with short notice. Maybe someday I’ll plan ahead for this… Anyway, I hope it goes really well and that everyone has a great time. really wish I lived in America – want to go so badly why does England not do anything as amazing as this! This entry was posted on August 13, 2014 by BioB in Blog Tour, Giveaway and tagged giveaway, GRNW Meetup.